Students don’t live in hermetically sealed containers, undisturbed by the oppression and exploitation around the world. Yet too often student unions behave as if they do. We constantly hear the rhetoric of the “average student” concerned only with the costs of printing and nights out, as if campuses aren’t implicated in the injustices which define our society. 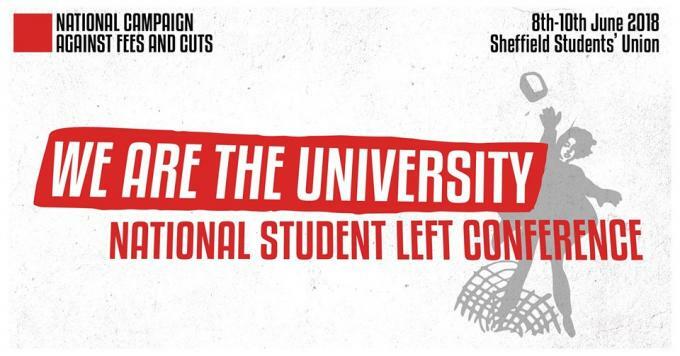 The National Campaign Against Fees and Cuts (NCAFC) held its winter conference in Liverpool last weekend, which saw a lively debate on whether or not to recommit to the 2018 NSS Boycott. After scrutinising the tactic and its potential effectiveness - particularly in relation to the upcoming UCU marking boycott - the conference voted overwhelmingly to continue the boycott into 2018 as part of building a movement of united students and workers against the marketisation of higher education. 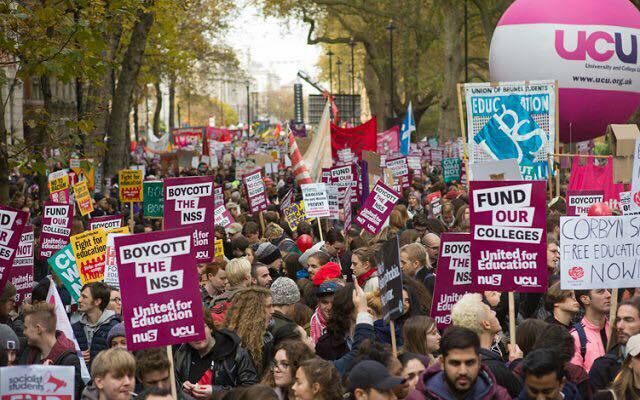 As many as 7,000 students marched through London on Wednesday 15 November to demand “Free Education now — tax the rich”. 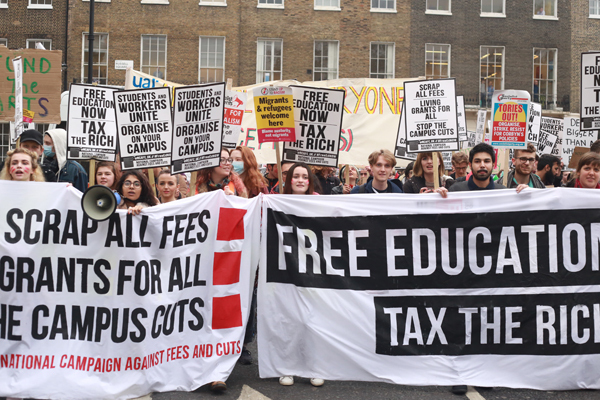 The protest was organised by the National Campaign Against Fees and Cuts and supported by Momentum, RMT, Unite, NUS Scotland and student unions across the country. Workers’ Liberty student activists were centrally involved in organising and leading the demonstration, along with other comrades in NCAFC. 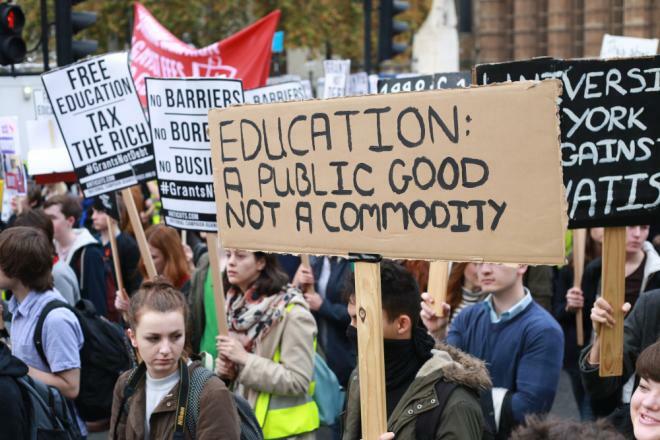 Read more about Free education now! “Mrs May”, writes the Tory-leaning columnist of the Financial Times, Janan Ganesh, “could not survive an election campaign saying so little so often if people paid attention”. Since so many don’t, “the repetition of slogans in lieu of answers carries no cost”. Fraser Nelson, another Tory, comments in the Spectator: “She seems to think that, if you refuse to give the press anything, the public won’t care. Worse, she seems to be right – for now, at least”. May’s purpose, so Nelson writes, is not to “seek a mandate”, but to evade one. On 21 March cleaning and catering workers employed by multinational corporation Aramark at the South London and Maudsley NHS mental health trust, which has sites across South London, struck for a £10 an hour minimum wage, full sick pay and proper unsocial hours payments.